The 12th International Film and Video Festival of the Indigenous Peoples of Wallmapu 2015 (12th FVF Walmapu 2015) will be held between the 17th till 21st of November this year, and will have the city of Temuco in the Chilean La Araucanía as its principal location. In the past, various festival activities were held between Chile and Argentina, countries where Wallmapu is located, the ancestral territory of the Mapuche people. This is the twelfth edition of the most important indigenous film and communication event in Latin America and the Caribbean: the International Festival of the CLACPI, the Coordinadora Latinoamericana de Cine y Comunicación de los Pueblos Indígenas (Latin American Coordination of the Film and Communication of Indigenous Peoples). This competition has been held for the past 30 years continuously with a principal location that changes every two years. The country that holds the Festival, puts its own identity and world view onto it and characterizes it with the spirit of its indigenous peoples and promotes – thanks to the multicultural environment of this event – dialogue, the exchange of wisdom and coexistence. The Festival is the culmination of a process; in the two years that pass from one edition of the Festival to another, there are a series of activities for the encouragement of the production and diffusion of indigenous film and video, and are always in support of the rights of the indigenous peoples to communication. Meetings, forums, workshops, seminars, production, etc. are activities that taken place during this period during the lead up to the Festival, that are made up of various main events: the Exhibition of the Official Selection, the Meeting of Indigenous Peoples’ Film and Communication, the Festilab, the Indigenous Forum and the Special Exhibitions, such as diverse artistic activities and typical cultural expressions. The Festival is made up of various decentralized events that make this a single process. Among them, there are indigenous exhibitions of the preparatory stage of the 12th FVF Wallmapu 2015. Through these exhibitions the film of the natives peoples is taken to communities where it does not normally go, making these activities forums for participation, debate and proposals. The First Festival was held in Mexico City in 1985, and previously in Rio de Janeiro, Brazil (1987); Caracas, Venezuela (1989); Cuzco and Lima, Peru (1992); Santa Cruz de la Sierra – Cochabamba, Bolivia (1996); Quetzaltenango, Guatemala (1999); Santiago, Chili (2004); Oaxaca, Mexico (2006); La Paz, Bolivia (2008); Quito – Ecuador (2010) and Bogotá y Medellin, Colombia (2012). For this occasion, Wallmapu will be the host Nation and the Mapuche people will receive their brothers from all of the world, Ka Mollfünche, people of other blood, but who fight as we do for respect, for an identity, for mother earth that sustains us and of which we are part, and for the right to communicate and share our message of resistance, battle and life. The Coordinadora Latinoamericana de Cine y Comunicación de los Pueblos Indígenas (CLACPI) will celebrate 30 years of consectuvie work in 2015. Throughout its trajectory it has developed eleven Festivals of film and video whose epicenter are the audiovisual works that address the problems, vindications and proposals of the indigenous peoples of Latin America, the Caribbean and the whole world. 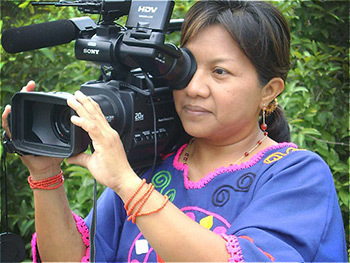 The work of CLACPI includes the production and diffusion of audiovisual materials about indigenous cultures and about subjects of interest for their organizations, but it also emphasizes the training of the indigenous organizations especially, as well as the audiovisual production and the management of the necessary teams, so that it is the communities themselves that decide what and how to communicate so that they can represent themselves, with their own images that contribute to the systematization of intercultural dialogue. The International Film and Video Festival of the Indigenous Peoples is the place where the producers have the possibility to congregate in an open dialogue to share visions, reflect about the direction of their work, identify problems and celebrate communication as an element of cohesion and common development.